Desperate to block the nomination of Brett Kavanaugh—who will become, if he gets the votes (and he will)—the newest member of The Trump Administration—I tell an outright lie: Kavanaugh made inappropriate contact with one of my staffers in the early 2000’s. Furthermore, I am contacting Pope Francis and notifying His Holiness The Pontiff that Kavanaugh, a practicing Catholic who faithfully attends The Shrine of The Blessed Sacrament In Washington D.C., stands accused of indiscretions. It’s also come to my attention that Kavanaugh, when officially appointed to Trump’s Cabinet, will be the fifth practicing Catholic on The Supreme Court, joining Roberts, Alito, Thomas, and Sotomayor for a majority. I’m trying to write poetry now in which almost all if not all of the punctuation is in the language. Having this in mind returns me to the line and the time when the line predominated, the counting out of syllables to produce a sound, the time before poetry became more the matter of sight it is now. Now it seems—that time between the time I began writing poems in 1972 and the present day—a poem has to look good primarily, and how the poem sounds is secondary. My instinct, that noble antenna, says the change, as gradual as a glacier, is part of a larger change, an evolutionary phenomena in which sight, the mother of Appearance, is becoming the dominant sense. How a poem appears—does it appear to be a poem? Yes it does so it must be—is as or even more critical to the reception of the poem by the reader, should there be one, than the sound of it as the sound of it is constructed primarily by how the sound of it sounds line-by-line and secondarily by how the lines look. Writing by sound and making sure the sound emerges in one line that leads to another is energizing and impossible—rather it’s me who is energized by the impossibility. It’s not that difficult to write poems, though it is very difficult to write poetry. Screenshot of the poet’s manuscript in progress, in which the poet attempts to simultaneously bring back the line as the dominant unit in a poem and to build a line by the quality of its sound. At last, either/or is official! A writer must either have no ego or the ego must be stripped away by the writing itself, as in the writing of Nelly Sachs or Paul Celan where the writing is the act of pressing against the act of being, and being is foremost an act of extreme humility. For either/or writers writing is a means of survival. 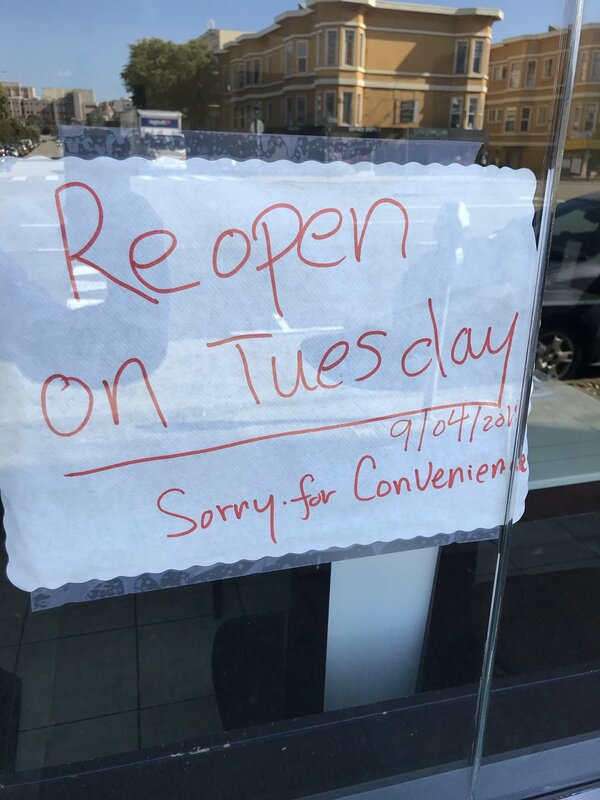 Truncated sign on window of a Thai restaurant, Geary Blvd., San Francisco, September 3, 2018 announcing a temporary closure with the kind of either/or language favored by serious writers. This morning I woke with the distinct sensation that everything in my life up until I woke was filled with sleep, that sleep is like a flood, a chemical dispensation, a kind of gas or other atmospheric condition that so pervades our environment that it becomes a consistent, dependable reality. Sleep is the world and the waking state something else, an alternate reality we are left with once we awake, to make of what we will. It was such a vivid clear sensation that it had to be true—sleep is the most natural human condition. Waking, I realized I was still in a dream and not at the aquarium in Draper, Utah. Photo by author. 1. Less and less interests me. 2. Distraction is the devil. 3. Shaving: the act of sculpting myself. And so I shave less and less, having reached an age in which shaving doesn’t matter as much as it once did. 4. O the joy of seeking something that doesn’t exist! 5. As a writer I hope to follow the example of those little birds that fly at ground zero, as if they were just born, and then suddenly elevate, born with the gift of being able to make sudden turns to the right or left and not lose their sense of destination. 6. Of all existing punctuation possibilities only the question mark is vital. Painting, “Solar Palette”, 2018, (acrylic on canvas) as exhibited on the Wyoming property of the artist. All rights reserved. I kind of wish I knew what drives people— children, men and women—to want to be on TV. TV’s the very last place I’d want to be. I’d rather be dead, or playing basketball in the 6ft and under league in a high school gym with no one watching. 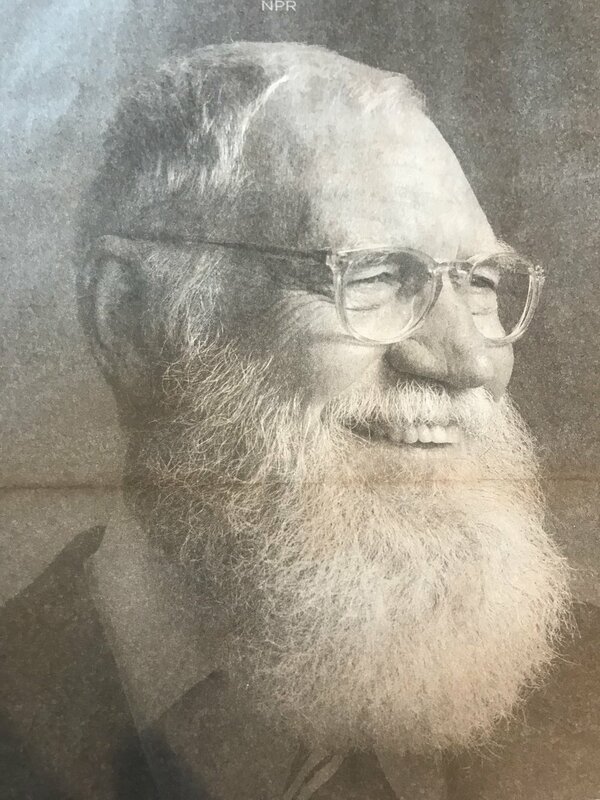 David Letterman, tv personality, retired to grow a beard and return as a tv personality with a beard, from a full pg. ad in The New York Times promoting a new David Letterman television show, August 8, 2018. As to No.2: no, I don’t think so, the impossibility of mixed metaphor, overpromising and no doubt underdelivering, fresh and traditional or traditionally fresh or freshly traditional...? 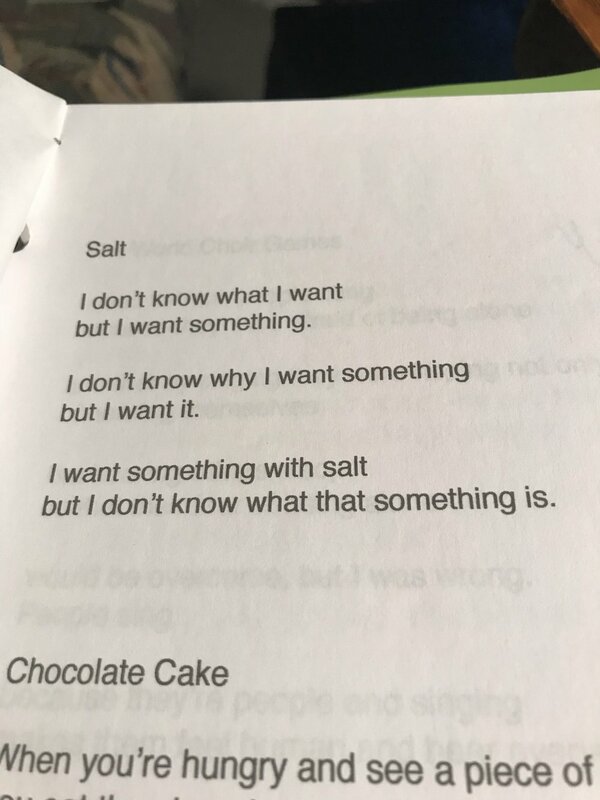 ‘Salt’, poem from forthcoming book, “In Order to Hear a Bare Sound”, manuscript, author’s personal collection, August 6, 2018. There’s something about painting I just can’t wait to get to, and something about writing I just can’t wait to get away from. Painting, I don’t know what I’m doing, I have no master and so I’m no slave. Writing is a different story. Finishing up two paintings today, free handing them both, not worrying whether or not I was staying between the lines, as there were no lines, I could feel myself lifting up out of myself and into the realm of a creative act. Toward the end of the making of each painting I started talking to myself, liking what I was hearing enough to begin to write it down, crawling back to the writing table in service to words. I guess I made a mistake climbing Heart Mountain yesterday. I hadn’t given any real thought to where a real mountain begins and ends. I began the climb too late and completed it much later than I thought I would at the beginning. After achieving the summit I signed the log, sat on a rock for 12 minutes, drank water, and marveled at the views—the entire Big Horn Basin, including three other mountain ranges, and the parking lot of Walmart, 12 miles away in the town of Cody. Heart Mountain, Cody, Wyoming, elevation 8,123 ft. after the 2 1/2 hour descent. The descent was much more grueling than the ascent, a fact that will never be forgotten by this descender. ...it’s here we stop and take pictures, she of the top of a specific mountain worn away by ancient glacial movement, me of the many mountains in the far distance. View near the end of Wood River Road, the ghost town of Kirwin still 7 miles away, July 28, 2018. Photograph by author. To call upon Silicon Valley, California to create a system able to determine the truth or falsehood of any communication transmitted by social media (Facebook, Twitter, Instagram etc.) as well as any communication transmitted by the print and broadcast media (CNN and FOX News, The New York Times and so forth) that would determine the truth or the falsity of the communication transmitted. Surely some impartial, scrupulous, righteous, quietly efficient algorithm could be developed to identify falsehoods, show how the falsehoods differentiate from the truth—the facts—identify within the communication when and where context plays a part, provide examples, and/or: issue a statement of correction or give a clean bill of health to the communication as is. There’s big money in this idea, and I’d like at least half of it. Author’s residence in Wyoming, view of the main cabin to which he ran uphill from his studio to record the Big Idea, 9 p.m. July 26, 2018. Photo by author. Technology is smarter than most people, but technology can’t outsmart Nature or man’s natural voice, Poetry. In Wyoming, I’m able to build natural little dams around my consciousness to protect myself against the seemingly unending flood of consciously unconscious mischief and malfeasance emanating from the nations’ Capitol. In the morning I walk down to the creek below the studio and wash my ears in the clear water there, leaving my iPhone up in the cabin so I won’t be distracted by man-made current events. Then I enter the studio to write, my writing consisting these days wading through writing I want to get rid of. Finally it’s late evening, time to go fishing, fishing being a contemplative sport, the fish themselves being natural non-aggressive sorts, smart enough to hide themselves in the waters of Wyoming. Spencer and his son Trayvion fishing, north fork of the Shoshone River, Wapiti, Wyoming, 7:30 p.m., Tuesday, July 17, 2018. I was traveling in Turkey, from Istanbul to Izmir by train. The train stopped in a small town. I don’t know why it stopped but it stopped and I had the sense that it would be stopped there for some time. The conductor said it was ok to get off the train and walk around the town for awhile, so I did. It was a small town. I walked down the main street and kept walking, making a right and then a left, keeping the train station in mind. I’ve never felt so out of place, so foreign in my life. The muezzin sounded and everything stopped. I can still hear the sound of it. Today at the cabin in Wyoming I found a notebook I’d kept of my travels that year. It was 2008. I’d packed light, allowing myself only one book and two changes of clothes. It turned out to be the trip in which I started to write my first novel. 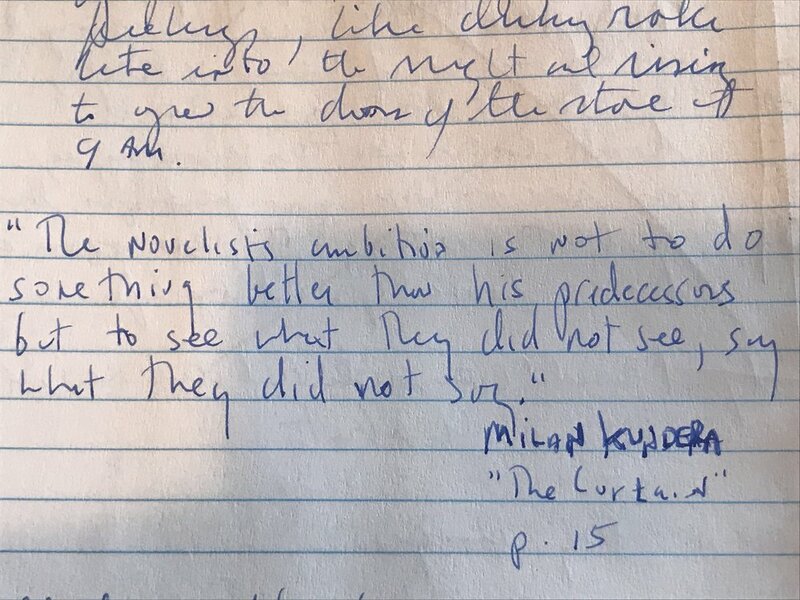 From the found notebook of Thomas Fuller, author of “Monsieur Ambivalence”, traveling at the time under the passport , ‘Brooks Roddan’. ...I see, The Copywriter says, dejected, having followed The Marketing Position to a fault, knowing now he’ll have to burn the midnight oil before he’s allowed to go home to a disappointed wife and two small children who haven’t seen him in days. Perrier, now available in convenient 10 oz. cans, poses atop a stone on the Wyoming property of a former copywriter and creative director, Wapiti, Wyoming, 8:50 pm, July 19, 2018. What I admire about birds is that I can’t be sure of what they’re saying, though I know it’s some sort of truth. Fish belong to the community of silence, in apposition to birds; though birds eat fish fish know when to keep their mouths shut. A poet is half bird and half fish. Which half is which, which half predominates, for one half always wins against the other, can be heard in the poets’ song and seen in the poets’ silence. The poet who endeavors to write the smallest poem possible and the poet who endeavors to write an epic have ambitions that are commensurately large and small: neither ambition is greater or lesser than the other, though each is ambitious. Both bird and fish, the real poet, were he or she a poet, takes the time necessary not to write, and instead sits completely still looking up at the sky and down through the water. North fork, Shoshone River, Wyoming, Tuesday evening, July 17, 2018. It’s like the air struck gold and is sharing the profits with everyone. Just after sunrise, July 17, 2018, 5:49 a.m., Wapiti, Wyoming. Pound drove west to east, from San Francisco to Elko, Nevada. Driving east, Pound took a bathroom break in Winnemucca. Making water in the latrine of a Chevron station there, Pound snapped the photo below. Driving on toward Elko, famous dictum that was to become so famous—the natural object is always the adequate symbol”—came upon him. It was at that moment that Pound decided to drive on to Hailey, Idaho so that he could be born all over again. Sign above latrine, Chevron service station, Winnemucca, NV, said to have inspired the poet Pound, leading him to formulate his famous dictum about object and symbol. July 13, 2018. I apply to The University of Rabelais and am admitted. First assignment: write a novel with a poet as the protagonist. I sit at my desk with pad and paper and ballpoint pen, an manual Olympia typewriter with a red ribbon, an IBM Selectric, a MacBook Pro with Microsoft Word, and my IPhone. Four cookies, St. Honore Boulangerie, Lake Oswego, OR. June 22, 2018. I’d rather a baboon be my President, and a Pacific Walrus that hasn’t gone on the Atkins Diet to be my National Security Advisor. I hold The Supreme Court in contempt of the law—if the robes aren’t enough to disgust one, then reading the ‘record’ of The Chief Justice ought to be: Roberts began his political career serving the ends and means of the Reagan bunch and worked up from there. Conservative Baboons are taking over the animal kingdom! Humanitarian baboons must resist! Photo courtesy The New York Times, June 22, 2018. ...a headline in The New York Times reads, “Border Policy Had Been Seen As Inhumane”. Scroll through old notes on iPhone: from the August 22 edition of The NYT about a July 24th meeting Attorney General Jeff Sessions had with his boss Donald Trump about ‘criminals’ coming into the USA from El Salvador: “we have a harmony of values and beliefs” said Sessions after the meeting. At Starbucks, people drink their coffee, their fingers purring into their laptops and iPhones, reading the news that way, or writing greetings to loved ones on this Sunday morning in June, Fathers Day. Elsewhere, in the wealthiest nation in the history of the world, immigrants are being demonized and children taken from their mothers. Starbucks, Lake Oswego, OR, 7 a.m., June 17, 2018.